Lord Siva, the deity of Thrissur Sree Vadakunnatha Temple is said to have manifested Himself on an umbrella carried by one of His beloved devotees, a pious old Namboothiri from Chowalloor Mazhavannoor Mana (lllam of Namboothiri), who used to walk all the way to Thrissur to have daily darshan of the Lord. When His devotee became too old to walk and worship him regularly, the Lord is said to have accompanied him to his native home in Chowalloor. Later a temple was constructed at the very place where the Lord appeared to His devotee and started regular pooja / Nithya Pooja. 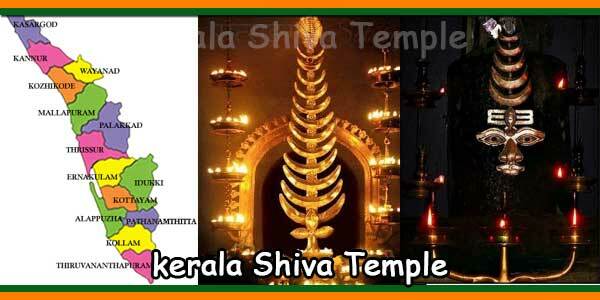 The devotees have the good fortune to worship Siva family – a rare phenomenon (Lord Siva, Sree Parvathy, Sree Ganesh, Sree Subrahmanian (Murukan), Sree Ayyappa and Sree Anjaneya) which is not seen else where in Kerala, (if not in too many Temples in Kerala). Navagraha Temple situates in the North East comer of the temple complex. 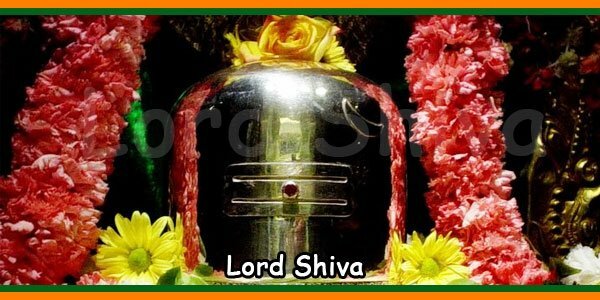 In the TWO TIERED round Sree kovil or Sanctum Sanctorum, the Swayambhoo idol of Lord Siva is seen facing west and that of His consort Sree Parvathy facing east affectionately showering blessings in all directions. 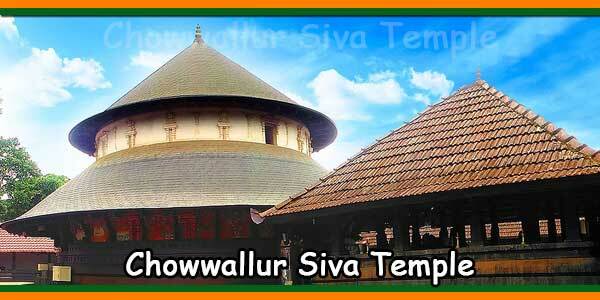 Thiruvathira Mahotsavam is the annual festival celebrated for 12 days. The festival is Concluding on the day Thiruvathira in the month of Ohanu. The above offering is performed to grant marital bliss for the numerous anxious brides and also to enjoy long lasting married life for wedded couples. Pattum Thaliyum Charthal offering starts on the first by after a colorful procession by TO clock in the morning and the same will be continued till 8.30 pm on the last day (12th day) after a procession with hundreds of pattum thaliyum accompanied by a bhajan of Sree Parvathy especially for those who could not participate in this offering and festival. 1) Devotees are requested not to enter the temple complex wearing shirt, baniyan, pants, lungi, pijama, churidar, chappals etc. Non Hindus are not allowed to enter into the temple complex. 2) Children below one year old are not allowed in the Nalambalam. 3) Children below 5 years old are not allowed to stay longer in the Nalambalam. 4) Please do switch off your mobile phones while entering the Nalambalam. Camera, video etc. are not allowed in the Nalambalam. Special permission to be obtained from the temple office to use camera and video in the outer temple complex. 5) As Siva temple, pradakshinam (rounds) in full is not allowed in the Nalambalam as we believe Holy Ganga flows to north from Lord Siva and should not be crossed. 6) Devotees are requested to take receipts for all offerings from the temple offerings counter. Devotees may give all the receipts except advance receipts to the main priest inside the Nalambalam where he distributes the prasadam for archana. Please do follow the timings of prasadam (nivedyam) distribution displayed on a board infront of the counter. 7) Kudam oil, ghee bowl for lamps may be placed only in the tray kept near the sopanam of Lord Mahadeva. 8) Thulabhharam offering with special and rare items may be conducted only with prior intimation to Devaswom, or the devotee may bring such items for the required weight. 9) Devotees who wish to offer Alroopam (silver/gold) to God may collect the same from the temple office or counter. For this offering, devotees may put any amount as they wish in the hundial. 10) Devotees may dedicate any item required for Rituals or Poojas in the temple at the Namaskara madapam situated in front of the main sanctum sanctorum. 11) Devotees may dedicate one tin of oil or pay Rs. 1500 in the counter to conduct year long the most important and simple offering “Pinvilakku” (oil lamp behind Lord Siva). The dedication may be done on an auspicious day like birthday, wedding day, house warming day, foundation day of your establishment etc. 12) Main offerings during the 12 days long Thiruvathira Mahotsavam (Festival) are Pattum Thaliyum charthal, Veda japam, Mangalya Pooja and such offerings may be booked in advance. The booking of the above will commence from the month of March every year and the festival takes place after nine months, in the month of December. As on the first Monday of all malayalam months, mass feeding is performed in the temple on all festival days to all devotees arriving for Darshan. Please do donate liberally to this fund and ensure your participation at least in one of the festival days in a year. 13) Every year, on the day of consecration (Pooyam star in the month of Kumbham ie between February 15 to March 15) Udayasthamana Pooja (12 hours long Poojas) is performed in the temple. On the very same day, varieties of Nivedyams are distributed to all devotees in the village enabling them to take away home such Nivedyams and the same is performed on the account of Devaswom. 14) When devotees bring back the small hundials distributed to them, please do dedicate the same on the sopanam of Sree Mahadeva before handing it over to the counter for counting and Issuing the receipt. If the counter is busy, especially on festival days, the counting may not be performed at the same time and if so. the receipt will be sent by post to your residence for which the name, address, telephone number etc are to be given to the counter staff to ensure the safe reaching of your receipt. 15) On all first Mondays of the Malayalam months (Muppattu Thinkal) Aghanda Namajapam (chanting of ‘Namasivaya* from morning 6 to evening 6) by several devotees together will be performed inside the Nalambalam (on the right side of the main entrance inside the Nalambalam and, everyday after the Deeparadhana (arathi) chanting of Vishnu Sahasra Namam is also performed at East Chuttambalam infront of the sanctum sanctorum of Sree Parvathy. All devotees arriving at the temple may Join in this. 16) Please do co-operate to keep the temple complex neat and tidy. 17) Please do follow the code of conduct of the temple. The Temple is just 3 km. towards East from GuruvayoorEast Nada. By Bus Alight at “Paris Road” or “Kandanaassry” Stop (Guruvayoor – Trichur Bus. Via. Chowalloorpady) and only live minutes walk to the temple. If, by own vehicle : Just altar 3 km. towards East from Guruvayoor. turn left from “Paris Road” Junction and drive straight only 200 meters and than you are In front of the Temple.